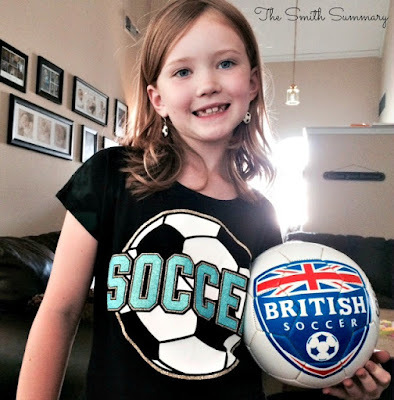 Last week Samantha was super excited to attend Challenger British Soccer Camp. 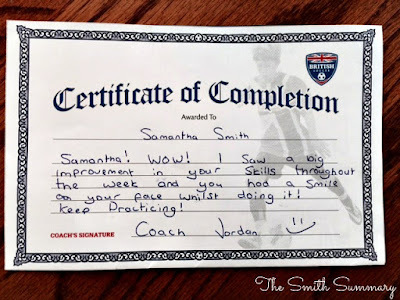 As I have mentioned before, Samantha attended the Challenger Tetra Brazil Soccer Camp last summer and really enjoyed it, so we were excited about the opportunity for her to attend the British camp this year. Since we had signed up early we were sent a free Challenger British Soccer camp jersey! On the first day of camp Sam received the camp shirt and soccer ball that she would use through the week. We opted for a day camp this summer since it worked with Mr. SS's new work schedule. Each day we would drop Sam off at camp and pick her up at lunch. It was really neat to listen to her talk about all the new skills she had learned and practiced that day. She was most proud of learning how to dribble backwards! Coach Jordan also played games with them to help them work on their skills. Samantha's favorite was British Bulldog, which was similar to tag. They also concluded the week with their own version of the World Cup! Samantha was proud to be on the Great Britain team, even though they didn't win. That was one big thing that, as a parent, I appreciated about British Soccer Camp - reinforcing that winning was not the most important thing, and that if you lose it's ok as long as you tried your best and had fun. That's one thing my super competitive soccer player struggles with!! At the end of the week, Coach Jordan also issued them each their own personalized Certificate of Completion, which Sam was super proud of. Overall we really enjoyed the week at Challenger British Soccer Camp! Samantha is already asking about going back next summer! And we are excited to see her bring her new skills to the soccer field in a few months when the fall season starts.